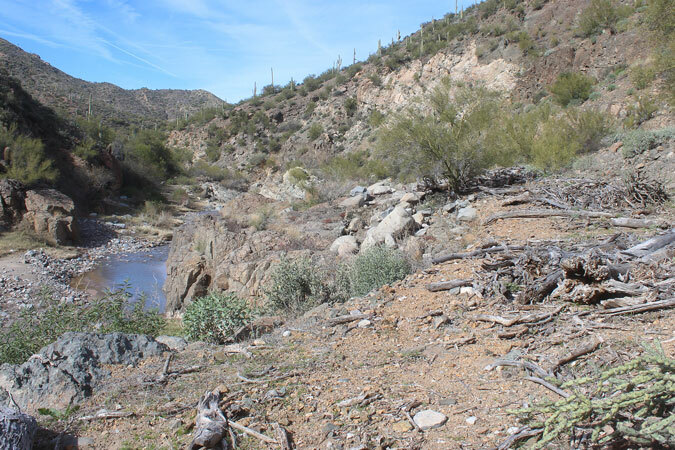 This mine is located on Deer Creek approximately 8 miles northeast of Winkelman in central Arizona. I grew up in Winkelman in the 1960's. and can remember trips out to this mine site. When I came across a series of photos that were taken by the mining engineer A. L. Flagg in 1923, I thought that I would venture out and see how the "Then" compared to the "Now". 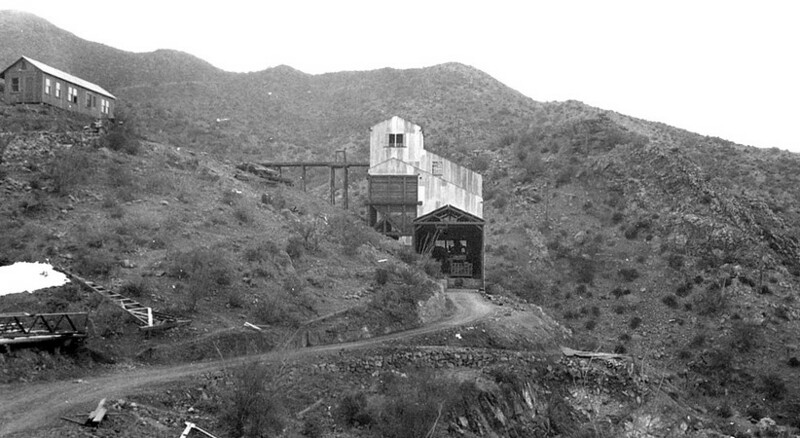 This mine, which was in production from 1920 to 1939, was credited with the production of silver, gold, lead, copper and zinc. It was the silver content that was the key to the success of the mine. Early on, the ores were treated at the smelter in Hayden. 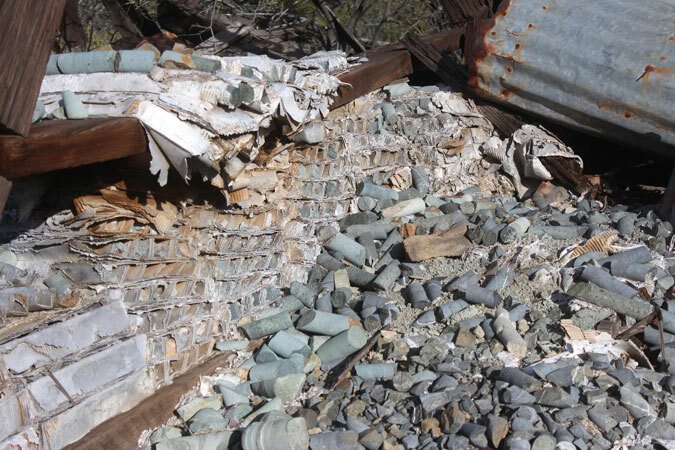 From the late 1920's through the 1930's, the concentrated ores were shipped to a smelter in El Paso,Texas. 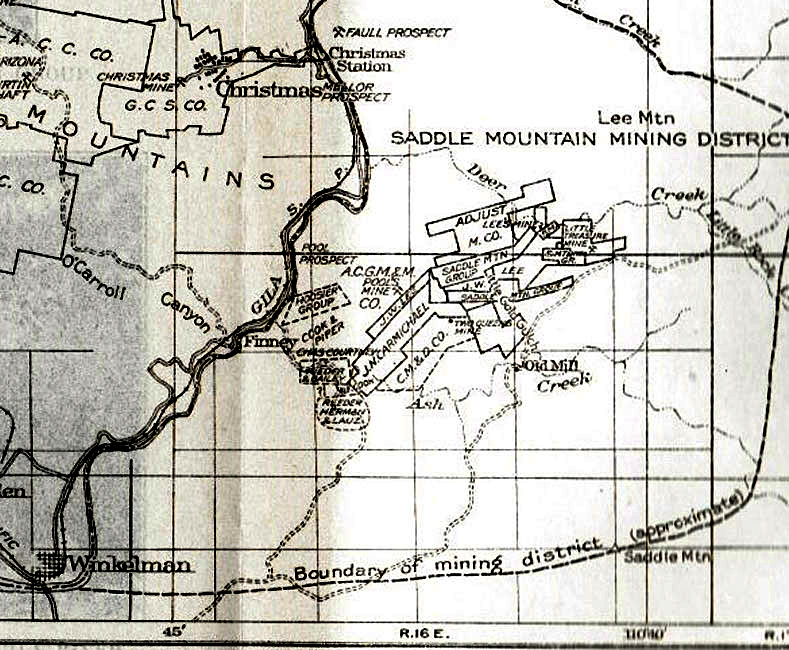 This map is from a 1925 USGS report on the "Ore Deposits of the Saddle Mountain and Banner Mining Districts of Arizona". The Adjust Mining Company claims appear in the center of the map. 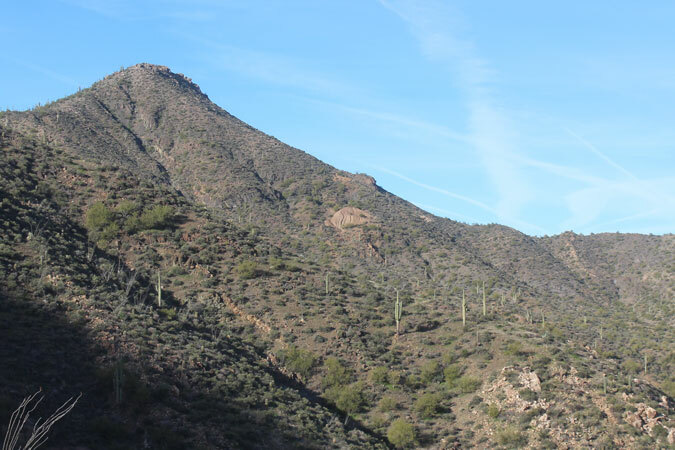 It was in the 1880's, that prospectors first went to work in these areas. There was a problem, however. 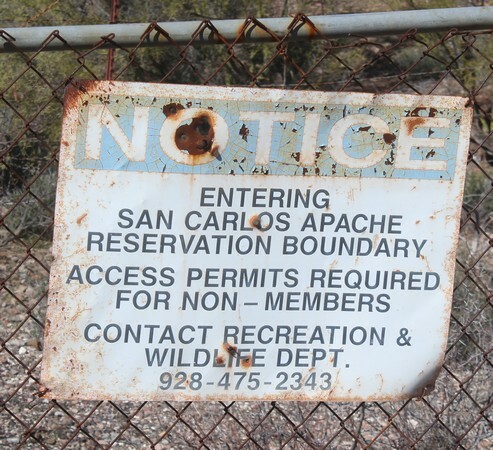 The majority of the lands were a part of the San Carlos Indian Reservation. A complaint by the Indian Agent to the federal government led to the mine operators being ordered off of the reservation. Instrumental to the success of the "No Mining" ban was General George Crook. One of the miners, however, had influential political friends in Washington and in 1902, President Teddy Roosevelt removed the contested areas from the reservation and placed the lands back into the public domain. Mining activity resumed soon after. 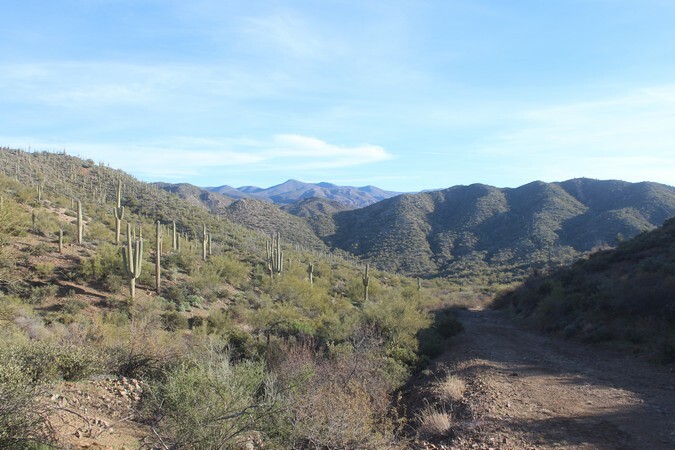 In the 1960's, those areas east of the Gila River were re-established as a part of the San Carlos Reservation. 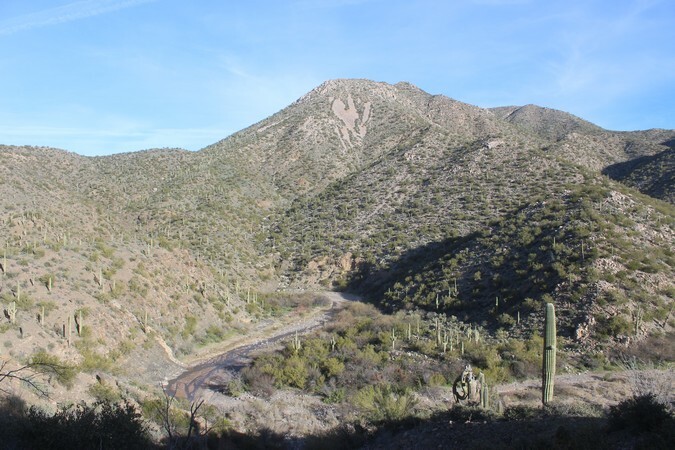 For years afterward, this "Mineral Strip" section of the San Carlos Reservation was off limits to non-tribal members. Signs on the roads that lead into the Mineral Strip seem to indicate that there has been a change in that policy. 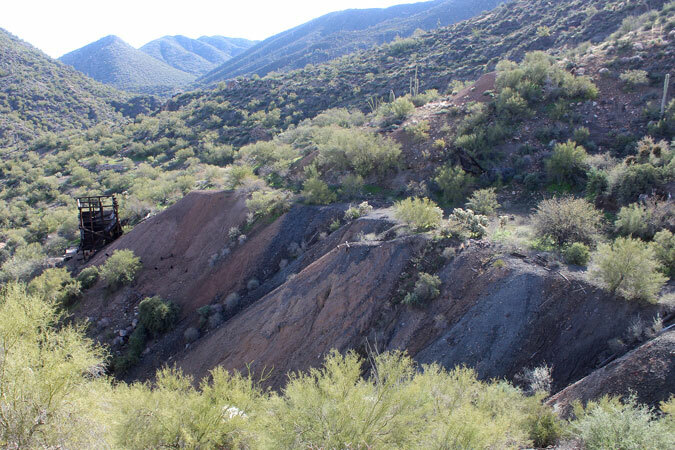 The closest location to the Mineral Strip to obtain the necessary permits is in Globe. I would not travel this area without that paperwork. 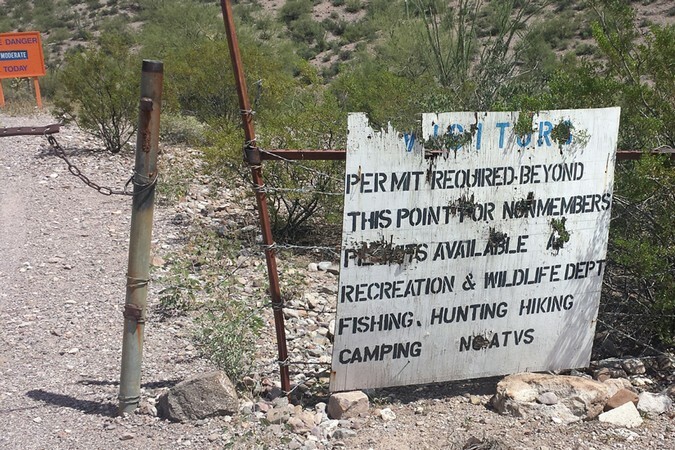 Elsewhere, the tribe is known to strictly enforce the permit requirement. ATV travel is also prohibited. I have heard of those machines being confiscated by Indian authorities. 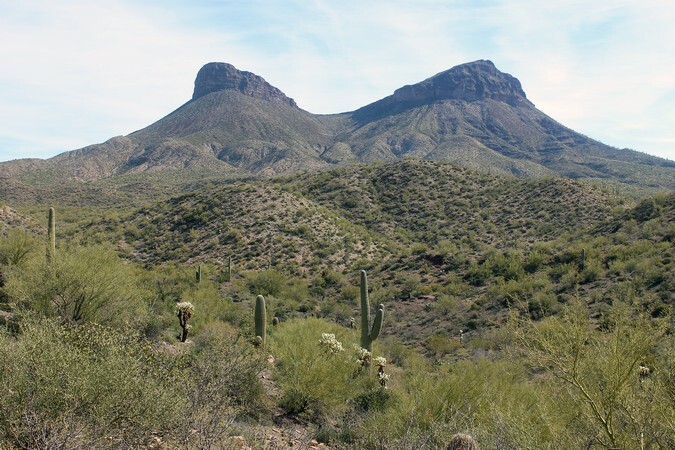 Saddle Mountain, the landmark that gave the mining district its name is very visible from the road into Deer Creek. The Deer Creek road, which begins on Highway 77 south of Winkelman, was built soon after 1902 to access the newly opened mining district. This photo was taken in 1903. It shows a government geologist on his way out to investigate the discovery of coal north of Deer Creek. 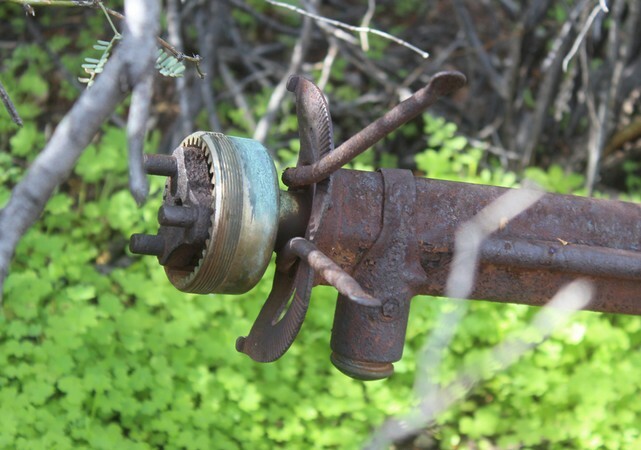 During the earliest days of the Adjust Mine, supplies were brought in on the Deer Creek road. 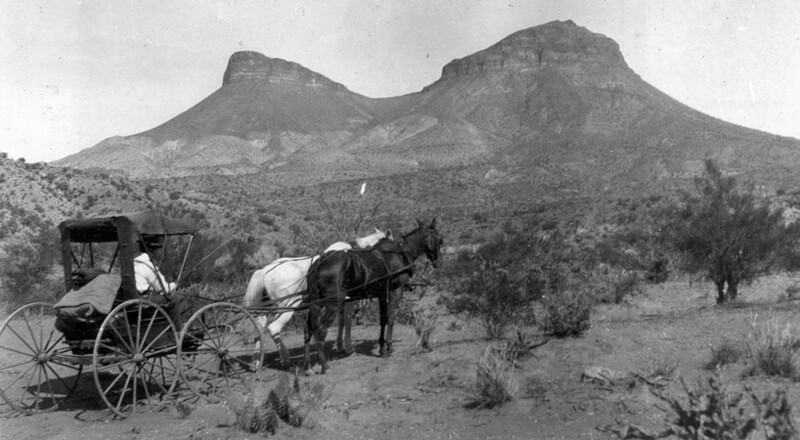 The mined ore was packed on burros down Deer Creek to the Christmas Station where the sacks of ore were transferred to railroad cars and then shipped to the smelter at Hayden. The location on the map marked as "Old Mill" was a mine camp on Ash Creek. These photos from 1903 show the set-up of the mill. The miners at this camp were N.H. Mellor and G.B. Chittenden. These guys would become the primary actors in the development of the Christmas mine to the northwest. 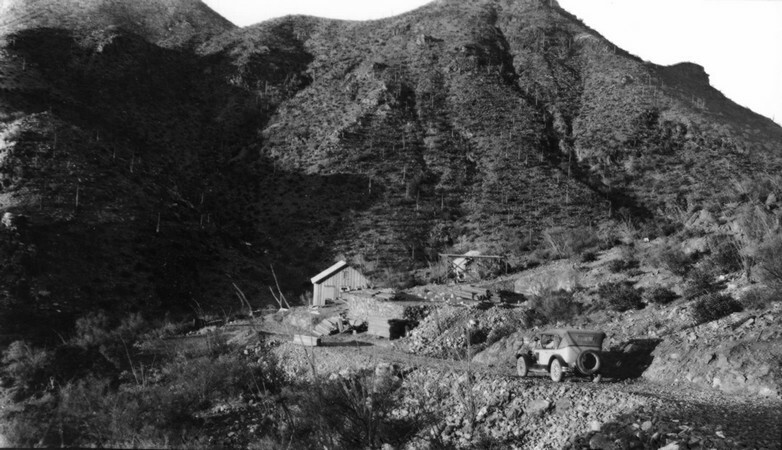 Mellor had made the original discovery of the Adjust Mine property. Nothing remains of the "Old Mill" today. When I made my way into the area, the section of the road through Ash Creek was very challenging. 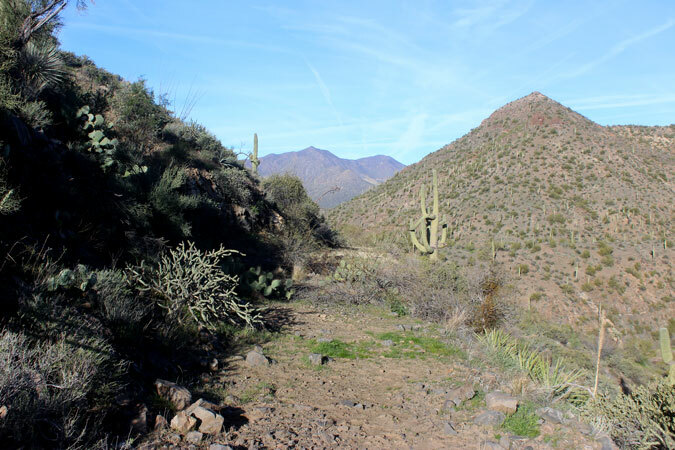 The final section of road into the Adjust Mine ran high above Deer Creek before dropping down to the bed level of the creek. 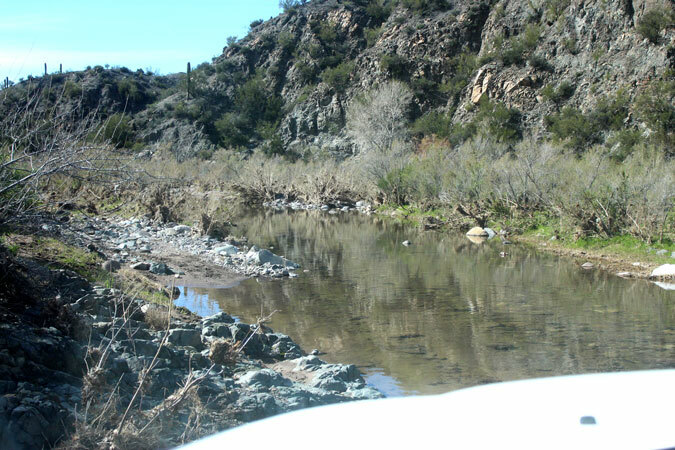 Today, the road and the creek bed are impassable to vehicular travel. 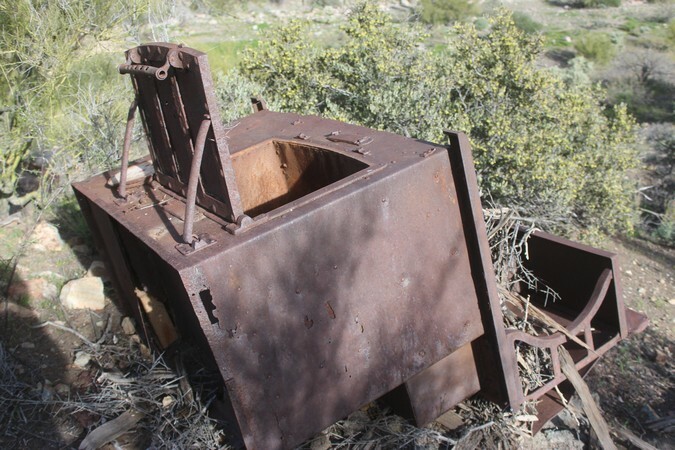 Several of the old workings of the Adjust Mine were located up on a hillside to the south of Deer Creek. The dump for one of those sites is the lighter colored material in the center of the photo. Beneath the surface, there were hundreds of feet of tunnels, stopes, raises and winzes. The old road once bypassed this section of Deer Creek. In this photo, the old road surface is nearly covered with driftwood. 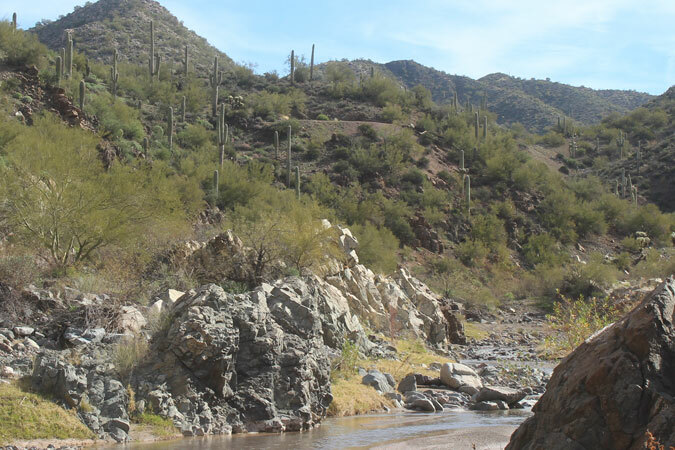 At times, flood waters must really roar down through this section of the canyon. 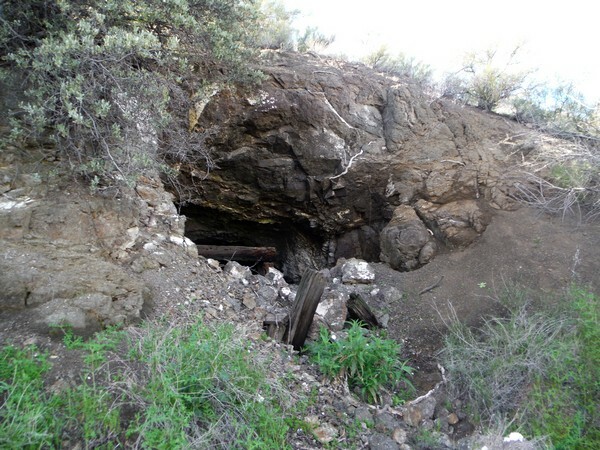 East of the Adjust Mine are several small dumps and foundations associated with Lee's Mine. in February, there was a nice flow of water in Deer Creek. 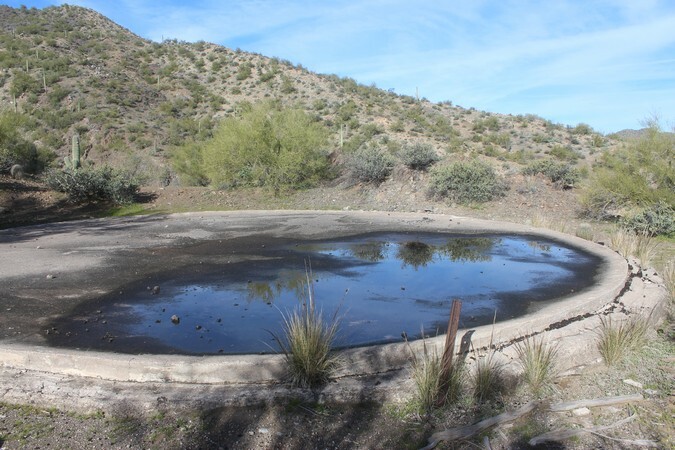 The early miners could only count on water from this source a few months of the year. 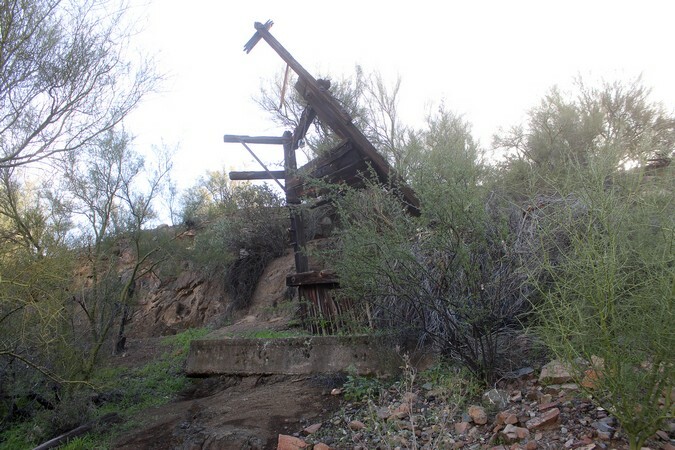 Up on a spur road to the south of Deer Creek are the ore bins of the old Adjust Mill. Not much else remains of the old camp and mill. The "Now" of 2017 is considerably different from the "Then" of 1923. I have not found any information on how the mill was set up in the 1920's, but in the 1930's, there was a Gates crusher, a conical ball mill, Dorr classifiers and thickeners. 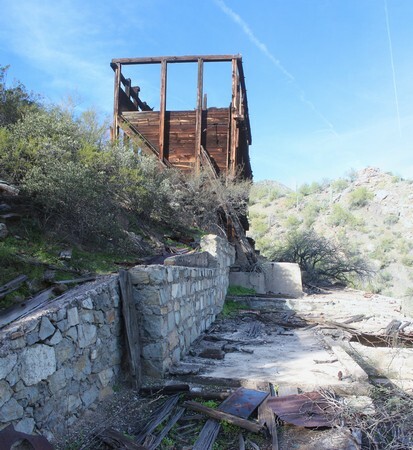 Prior to the mill's construction, there had been a proposal to erect an aerial tramway and fly the ore materials to a mill that would have been built on the banks of the Gila River 1.5 miles to the west. Evidently, that idea was not pursued. This mill was designed to produce 100 tons of concentrates daily. Engineeering reports suggest that level of production was never accomplished. 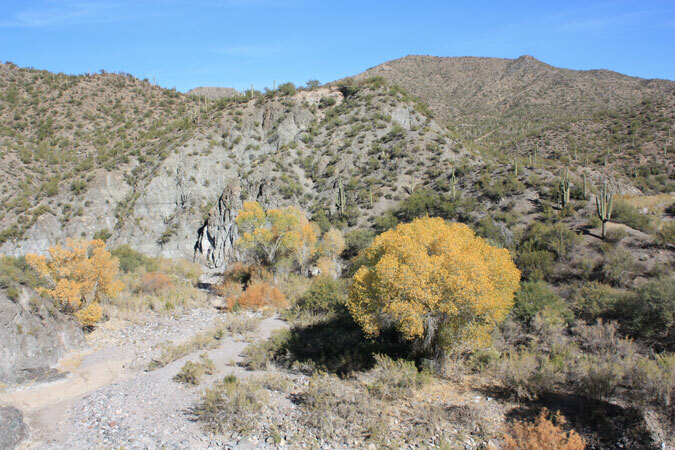 The mine operators claimed that their concentrating process recovered more than 90% of the silver, gold and lead present in the ore. The ore bins were pretty substantial. This circular concrete foundation may have been the base for the thickener. Mr. Flagg had a son along on his visit to the mine. 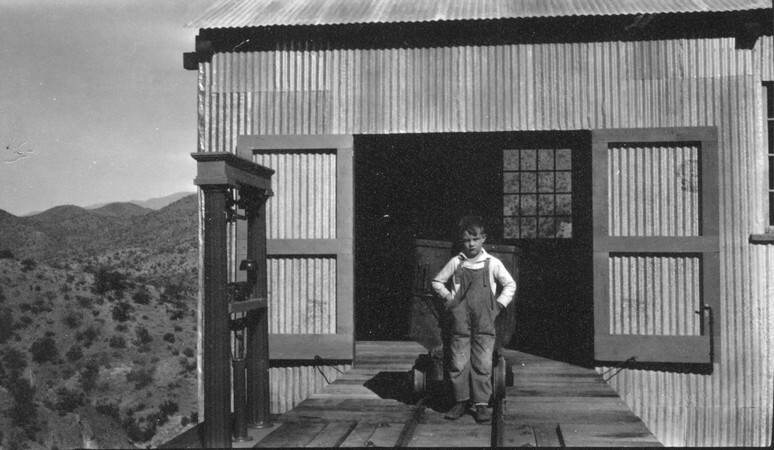 In this photo, the young Flagg is standing in front of an ore car at the opening to the ore bins. The machine to his right appears to be a scale that would have been used to keep track of the weight of the ore material that was processed. 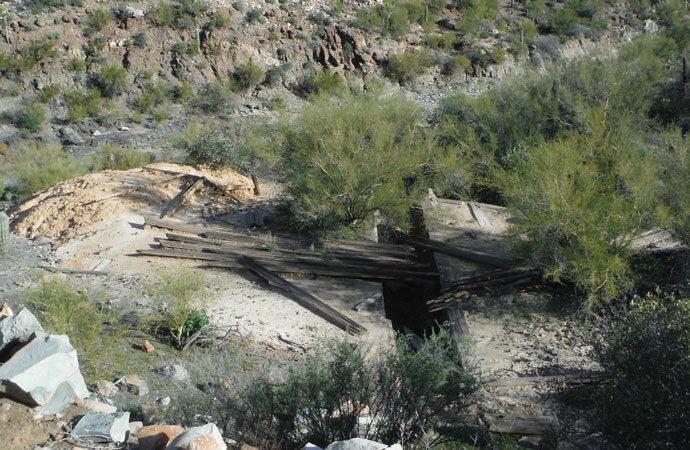 In 2017, nothing remains of the old rail line, the trestle, or the building. 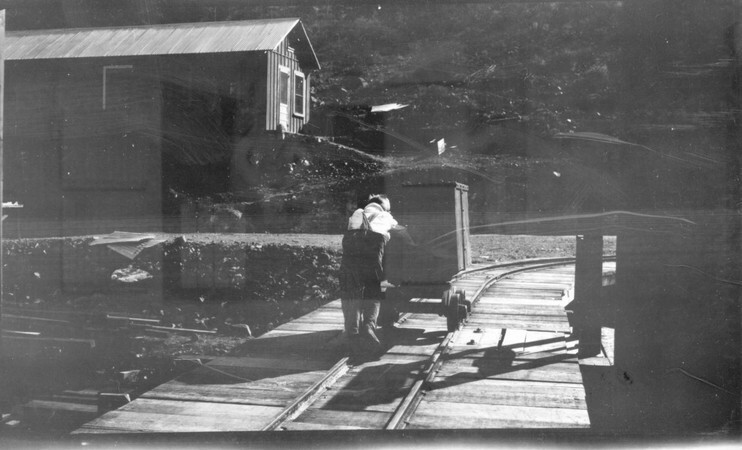 In this photo, the son is seen pushing the ore car back to the portal of the mine tunnel. It was not far around the corner to the right. 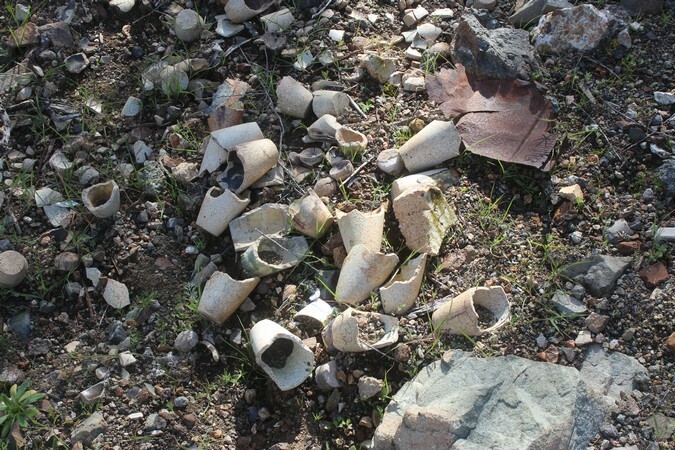 At one end of the site where the building in the photo above once stood is this pile of old assay crucibles and cupels. 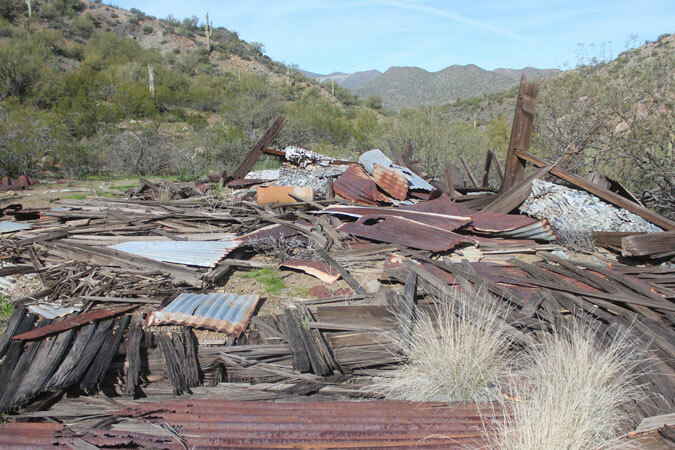 One engineering report noted that one of the buildings served as an assay office, and general mine office. Perhaps the building in the photo was that structure. The mine rails in the early photos above, would have led to this tunnel. It has all but collapsed in on itself. 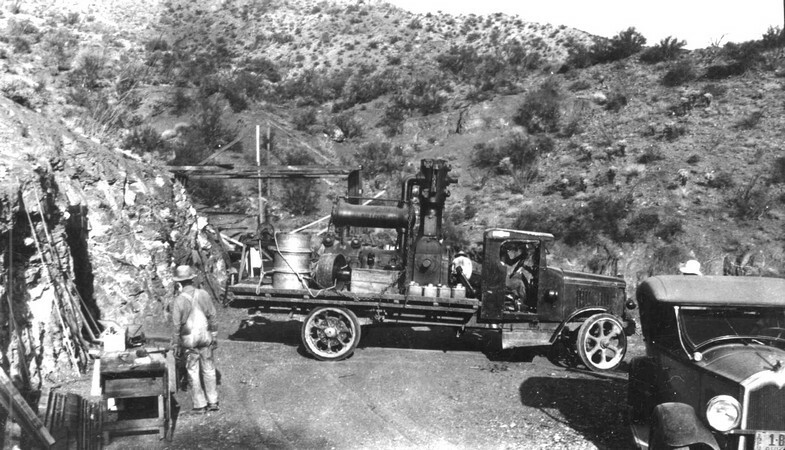 This 1923 photo shows a crew of men maneuvering an engine and compressor into position. Were these concrete foundations the site for the engine and compressor in the photo above? Electrical transformers may have once set on this concrete foundaton. In the 1930's, electrical power was obtained from the San Carlos Irrigation Project at the Coolidge Dam. 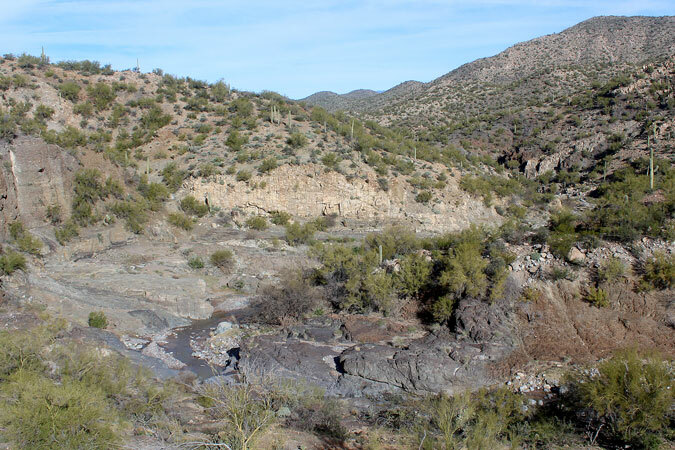 The connection to that power was made somewhere near the junction of Deer Creek and the Gila River. 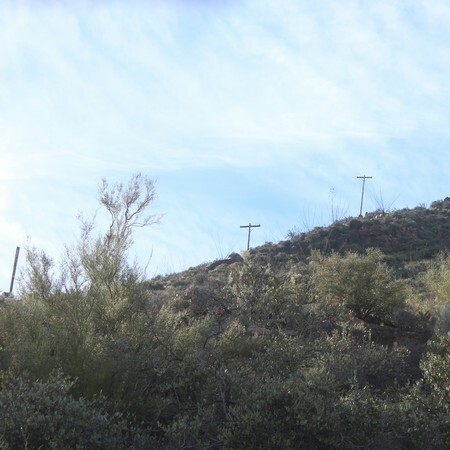 The mining company put in their power poles and wires. There also was a telephone line that ran to the pump station on the river. Remnants of the power line can be seen on the hillside above the camp. The upper mine workings, as well as the camp were electrified. There apparently was also a telephone line that connected the camp to those upper workings. 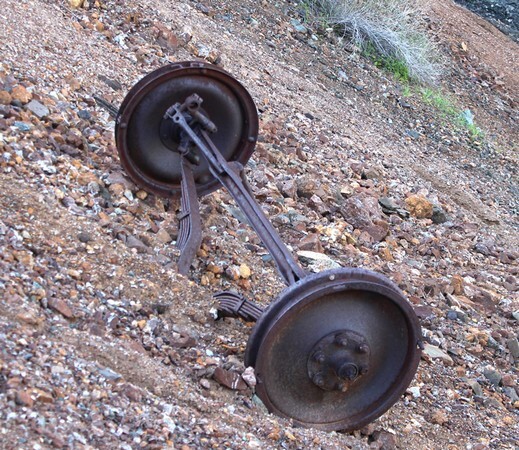 There are a couple of interesting axles and wheels on the old mine dump. 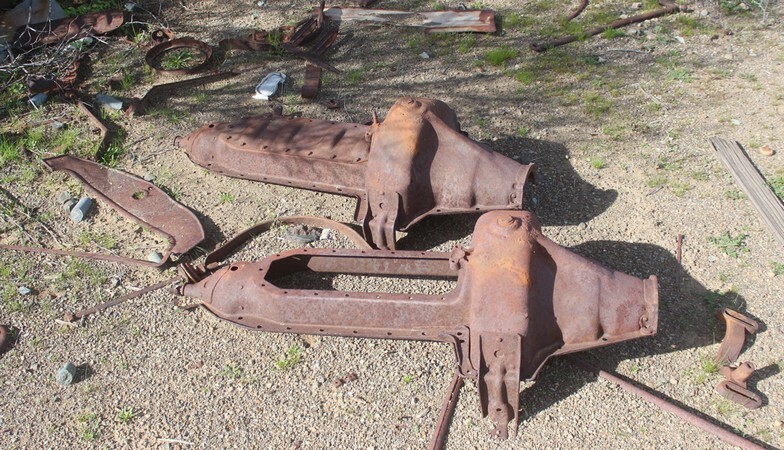 Several friends have come to the conclusion that these axles are not OEM off of any particular car or truck, but are assemblies that were put together from several different vehicles. 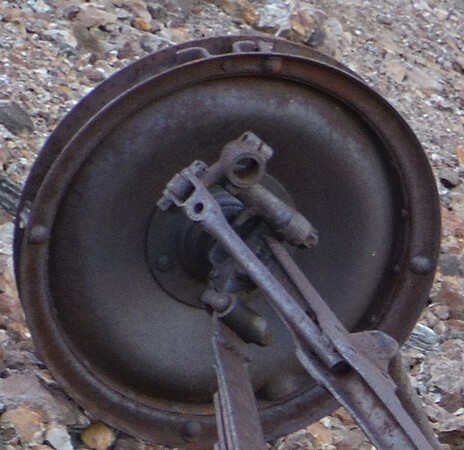 It appears that the interesting "camelback" springs were not original to these particular axles. The steering arms on this axle have been cut and welded to create a ridgid non-steering axle. 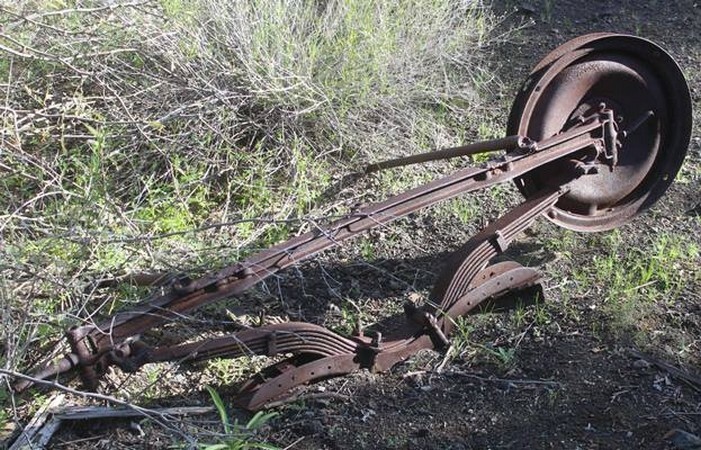 Were these parts re-manufactured into a wagon or cart? 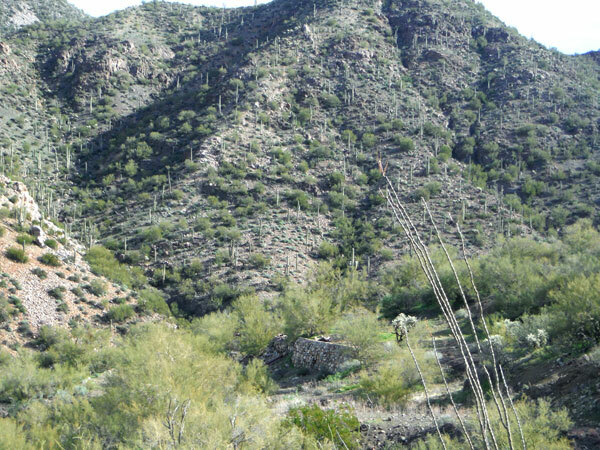 This is a view down onto the mine dump and the mill site from a ridge to the west. The dump is pretty extensive. 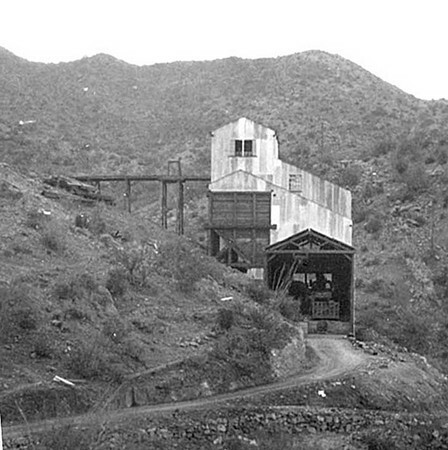 Thousands of tons of ore were shipped from this mine during its lifetime. 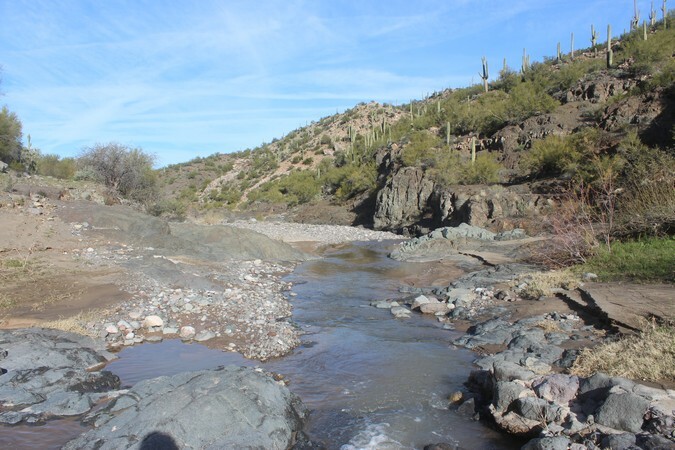 In the 1960's it was possible to drive on down the bed of Deer Creek to the Gila River. That is not happening today. This concrete disk once supported a steel water tank. 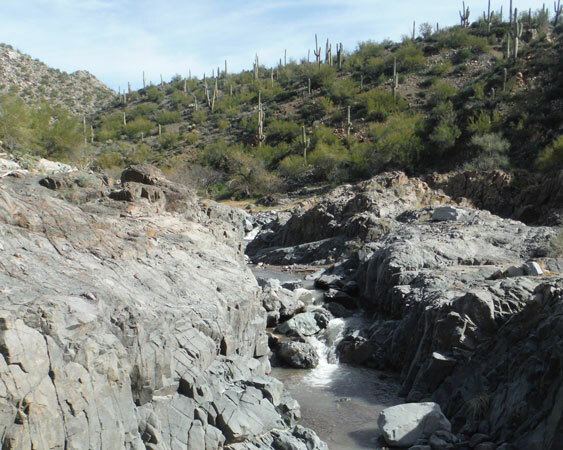 Water was pumped from the Gila River to provide for the needs of the mill and the camp. Engineering reports noted that the steel tank had a capacity of 49,000 gallons. 12000' of pipeline was used to bring the water up from the river. 8000' of the line was 4" diameter pipe and 4000' feet was 3" diameter. Nothing remains of that pipeline. 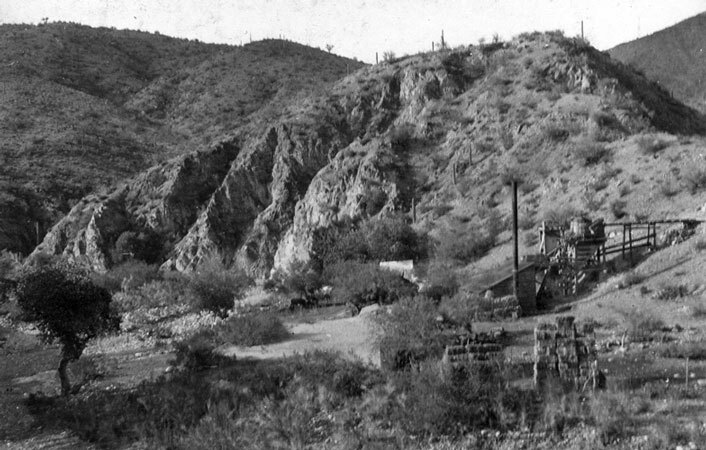 This photo, also from 1923, was taken near the pump station on the Gila River west of the mine camp. 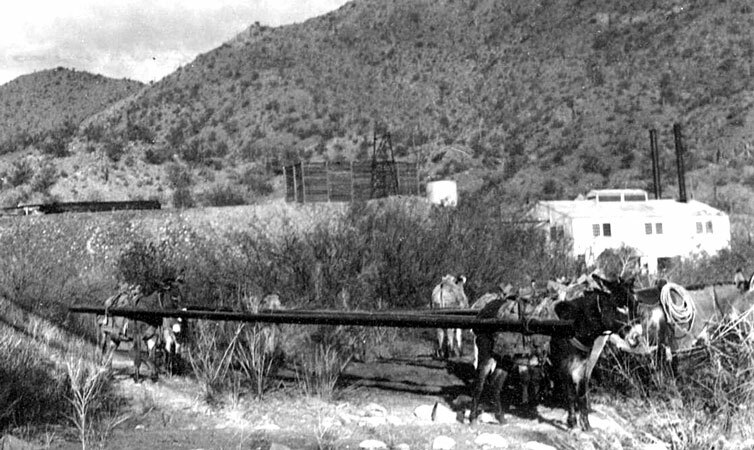 The burros were loaded with the lengths of pipe used to provide water to the Adjust Mill. Today, there is no evidence that the pump facility ever existed. East of the mill site was another section of the camp. 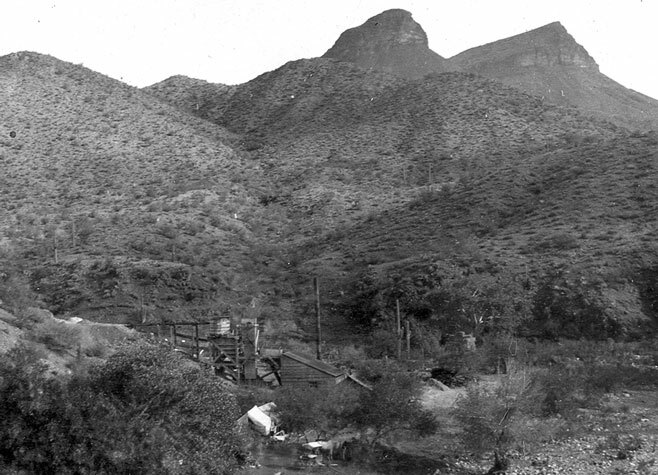 This 1923 photo suggests that the area was under development. 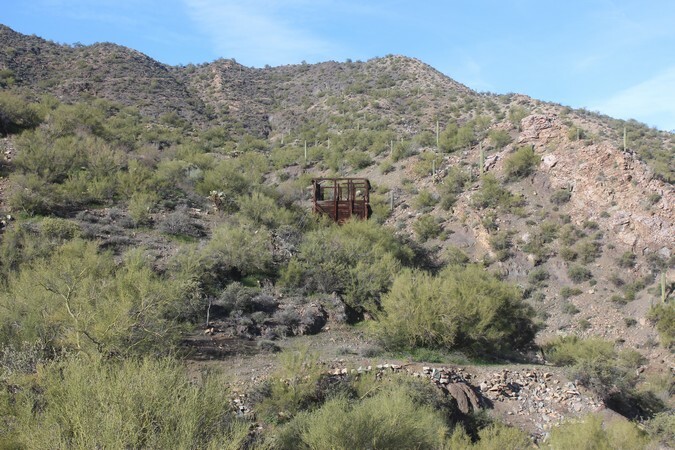 Later in the mine's history, it was noted that there were 21 buildings at the camp. Included were a cook shack, change room, bunkhouse for 12 men, and a blacksmith shop. This is the same area as it appeared in 2017. All that remains is the retaining wall and a few other terraced areas. There is very little lumber or sheet metal at those places in the early photos where there were wooden buildings. I wonder if those materials ended up being recycled elsewhere? This large industrial style oven was on the terrace behind the retaining wall. I have never really seen anything like this at any other site. It is much more common to find stoves with a less "industrial" feel like this one manufactured by the Malliable Iron Range company. 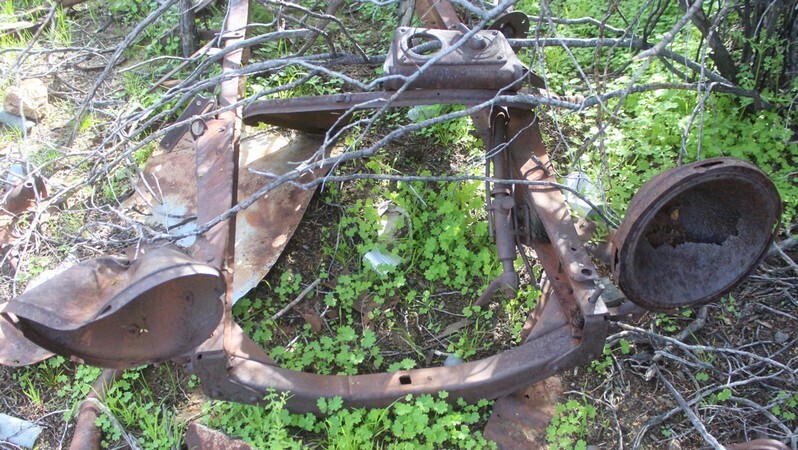 On one of the large terraces are many old car parts. 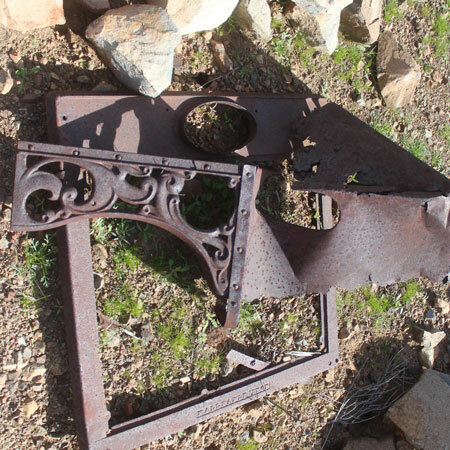 These oil pans look very similar to ones identified as Model T type. 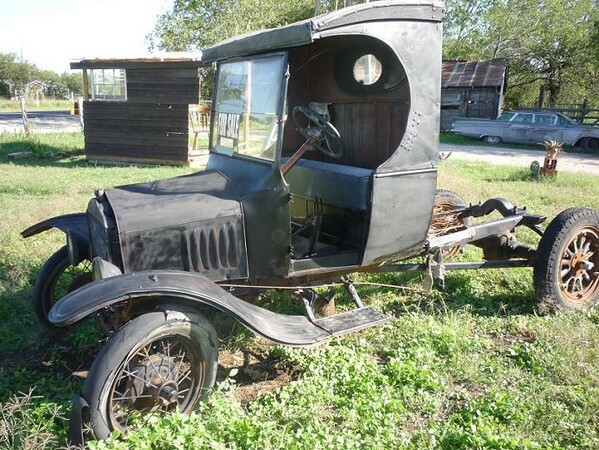 Perhaps this old frame may also trace its lineage back to the days of the Model T.
Could the frame and parts at the Adjust Mine have once been assembled into a vehicle like this....a mid 1920's era Model TT truck? 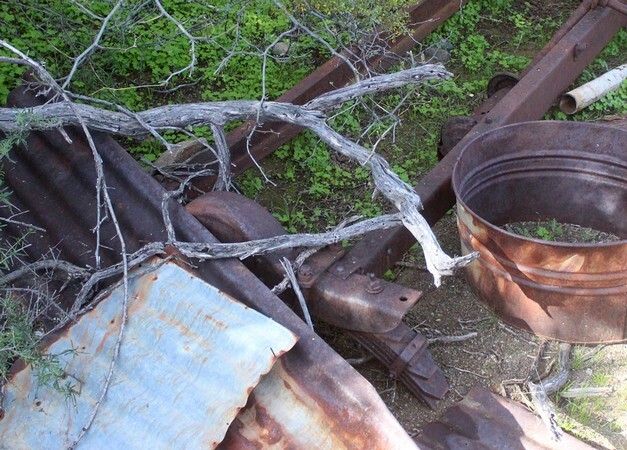 In a later report of the equipment at the mine site, there are "trucks" listed, but there is no mention of how many or what kind that they were. Near the old auto/truck parts are one of the few ruins of an old building. Could this have been some sort of shop building? The properties of the Adjust Mine were core drilled in 1967. This was done as part of a government program to increase the domestic supplies of silver. Is it appropriate to assume from the presence of the drill cores that this bulding was still standing in 1967? 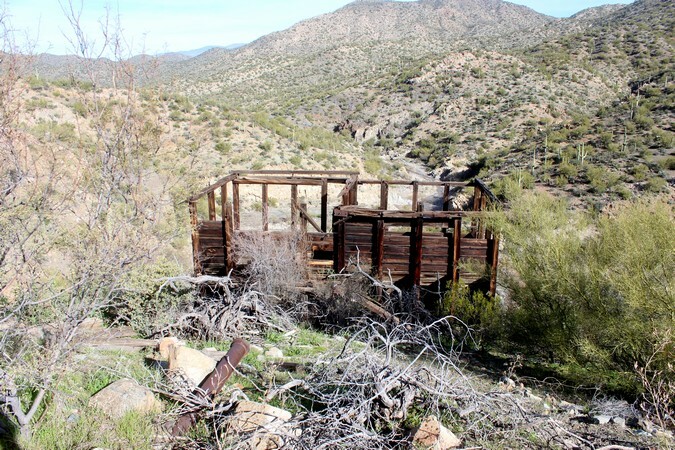 The latest activity that I have been able to find for the mine was in the 1940's when several of the old mine workings were being renovated. I do not think that there was any actual production from the mine at that time or anytime afterwards. I do not know what the results of the core drilling that was done in the 1960's were. It is apparent that there has been no activity in the area for a very long time.